[Skinsational News]: It's Your Free Skin Care Holiday Gift! 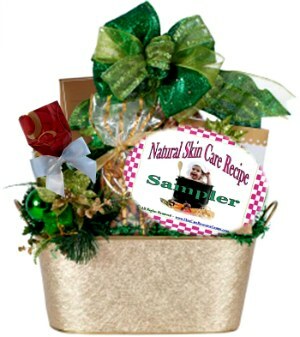 It's Your Very Special Holiday Skin Care Gift! As promised last month I have an extra special skin care gift for you. Keep a set for yourself and create a thoughtful (yet cheap and easy) present for all your friends, neighbors, teachers or whomever! It's a set of custom designed natural skin care recipe cards created exclusively for you. . .
Be sure to follow the print instructions so they will look professional and classy. Then, go ahead and create as many personalized gifts as you want! At your favorite dollar, discount or craft store pick-up some small pretty bowls, baskets, or any little container that strikes your fancy. You will also need some gift straw or other type of "filler" to line the bottom of the container, some cellophane wrap or fabric netting, ribbon, small clear plastic bags that you can tie the top with a small ribbon, and some or all of the ingredients for any of the natural skin care recipes. Use the small, clear gift bags to portion out the dry ingredients for a recipe. For example, place a generous scoop of oatmeal in a bag then simply tie the top with a pretty ribbon. Arrange the recipe card along with the ingredients in the gift container, wrap with cellophane, add a bow and tag ~ VIOLA! You're done! These little gift baskets are a lovely and very thoughtful gift that your friends will be sure to enjoy! You can add all sorts of interesting items like a honey dipper, mixing spoon, a gift card, or the paperback version of Naturally Skinsational ~ Rejuvenating Skin Care Recipes. It's all up to how inspired you want to be. . .
Give 'em the Business! This is an unusual gift for sure but one that brings rewards forever after. It's a gift of opportunity. One for you and the lucky person who you bestow the other one to. (Quick Note: The special is only offered through 12/24/11). And to answer the question that I'm asked at least a gazillion times a week, of course you can do it!